To improve our project we collaborated with several other iGEM teams, returning the favor for them as well. These collaborations include surveys, campaigns, webinars, BioBrick testing and other laboratory partnerships. These, in turn, can roughly be divided into two categories: wet-lab collaborations and human practices collaborations. We collaborated with iGEM TUDelft, Utrecht, USP-Brazil, Uppsala and Cologne-Duesseldorf. Moreover, we had meaningful collaborations with two institutes: The Dutch National Institute for Public Health and the Environment (RIVM) and the Rathenau Institute. We collaborated with iGEM TUDelft. As both projects involve a diagnostic tool in live cells, it is important to correctly and easily preserve the cells for storage and shipping, ideally without the need of a cold-chain. We tested the cell stabilization properties of these BioBricks by drying E. coli BL21(DE3) cells that produce these proteins and measuring their viability. Apart from cell survival data, we also provided a possible improvement in their protocol. Instead of washing the cells with water, we proposed to wash with PBS. In our case, it provides a significant improvement in cell survival for 1 out of 3 BioBricks. The protocol can be found here and the results can be found in Figure 1. 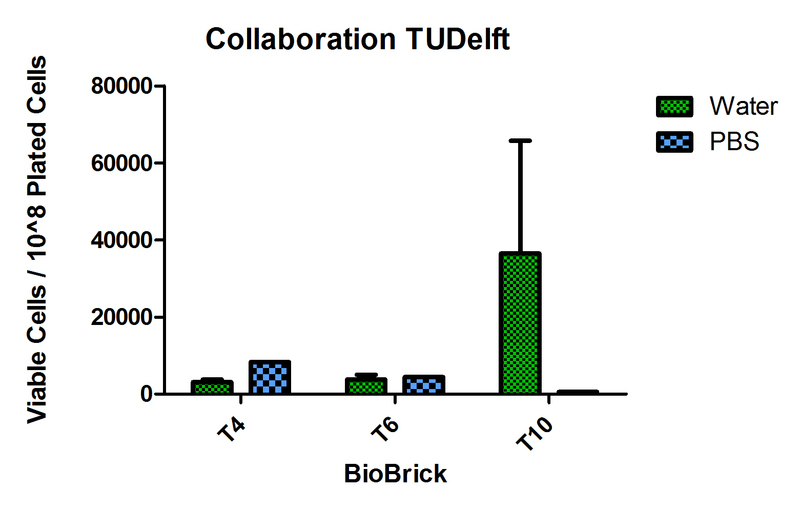 Figure 1: Results of the BioBrick testing for iGEM TUDelft. We tested viability of E. coli cells with three different constructs (T4, T6 and T10). Viability was measured as viable cells per 108 cells plated. In return, iGEM TUDelft tested another preservation method for us. We tested an easy method to dry and preserve cells: in kaolin clay. More about this experiment can be found on our demo page. TUDelft performed the same experiment for us using the same clay. This gives us more data on this procedure and feedback on the comprehensibility of the protocol we created. The protocol can be found here. The results of this experiment performed by iGEM TUDelft were inconclusive. Either zero colonies were counted, or the plate was overgrown. However, we received valuable feedback on our cell preservation method. They used E. coli BL21(DE3) whereas we used DH5a. Since their results are inconclusive, the strain of E. coli might have an influence on the success rate of drying. Due to time constraints this could not be validated. Moreover, in their opinion this drying protocol was not easy nor practical to perform. Scraping the dried cells of the plate is a lengthy process and high concentrations of kaolin made it troublesome to distinguish colonies on the plates. From this, we conclude that our protocol is far from ideal. Although this preservation method is cheap and does not require expensive equipment, it may be more labor-intensive than expected and not as reproducible as we hoped. A next step would be to perform this experiments in different strains of E. coli and measure viability and reproducibility, as well as looking further into preservation methods. In this research, the use of Tardigrade proteins can also be taken into consideration. We also performed a mutual collaboration with iGEM Utrecht. For us, they characterized three BioBricks involved in the fluorescent output of our device. In turn, we analyzed their samples on a western blot. 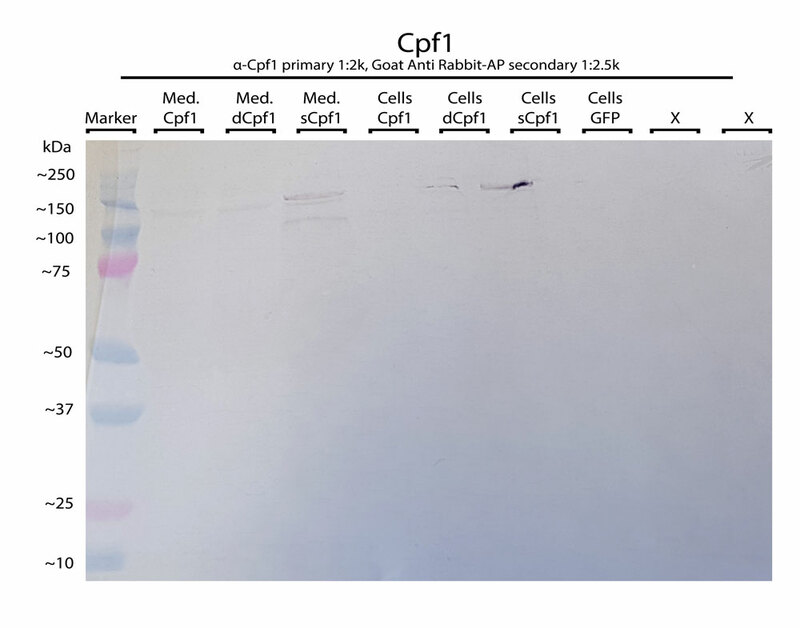 To verify the secretion of sCpf1 and sCas9 by the animal cells of iGEM Utrecht, we performed a western blot analysis. For this, samples of both the medium and the cells were prepared. We ran these samples on a SDS-gel in our laboratory, followed by western blotting. 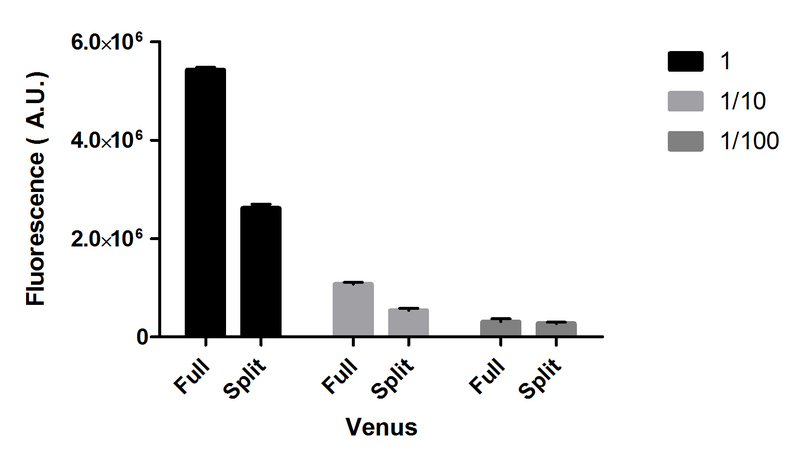 The full protocol can be found here and the results of the western blot can be found below. 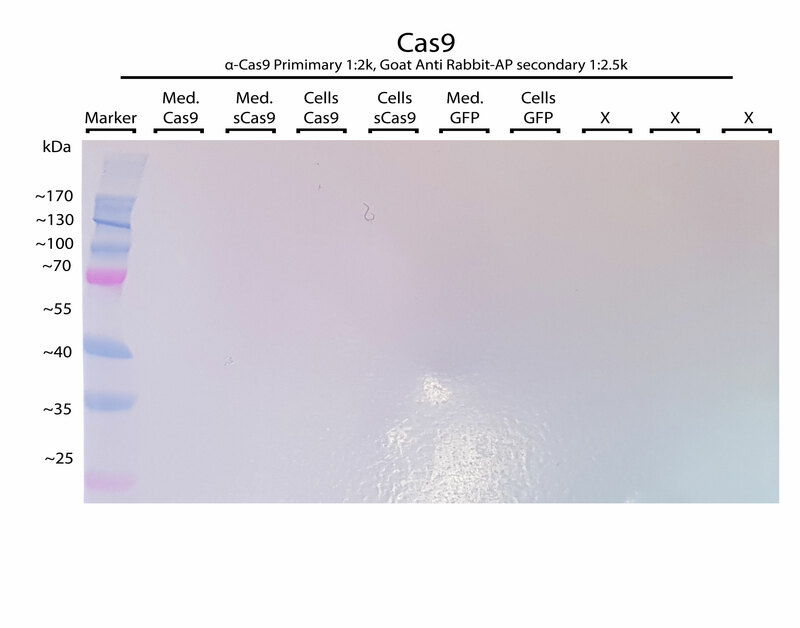 Figure A: Results for iGEM Utrecht of the western blot for Cas9 protein in both medium and cells. 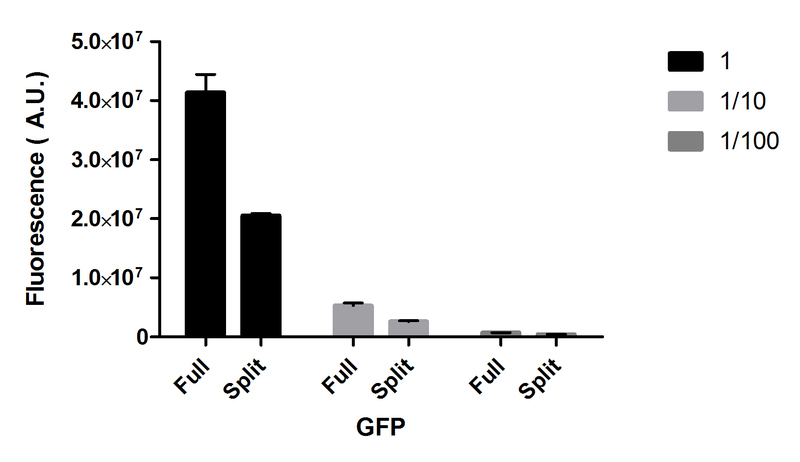 Figure B: Results for iGEM Utrecht of the western blot for Cpf1 protein in both medium and cells. 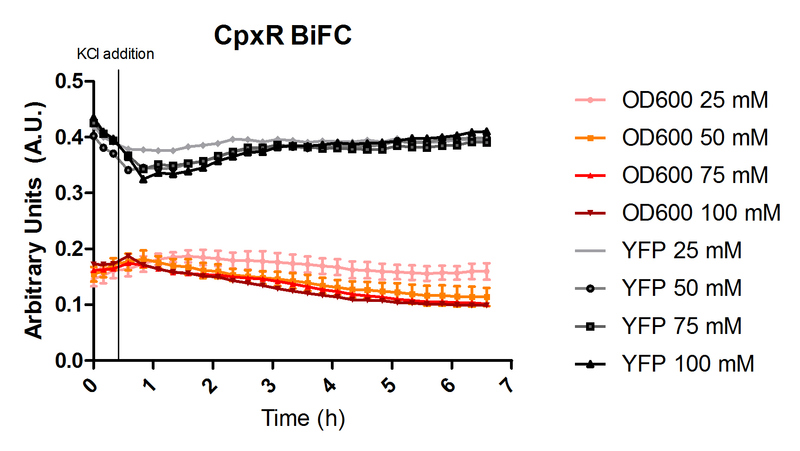 iGEM Utrecht did measurements on our visualization module by testing five of our BioBricks: the CpxR construct (BBa_K2387032) and the BiFC system with both GFP and Venus ( BBa_K2387045, BBa_K2387046, BBa_K2387047 and BBa_K2387048). Read more about this on the specific visualization and fluorescent proteins pages. The protocol that is used in this collaboration can be found here. Figure C: Results of the BBa_K2387032 testing by iGEM Utrecht. Figure D: Results of the BBa_K2387045 and BBa_K2387046 testing by iGEM Utrecht. Figure E: Results of the BBa_K2387047 and BBa_K2387048 testing by iGEM Utrecht. To get a better insight into the situation in Brazil with regard to viral diseases like Zika and dengue, we contacted the iGEM team from Brazil. Apart from reading literature and talking to experts in the Western world, talking to locals can also be of great value. We got inside information from the iGEM team of Brazil and via them, we also got into contact with dr. Tatiana Mingote Ferreira de Azara, Health Surveillance Secretary of the Brazilian Ministry of Health. Through a Skype meeting with iGEM USP-Brazil we really got to know the local situation in Brazil. We gained valuable insight into the measures being taken by the government and the population to prevent infection by mosquito-borne diseases. We learned that the government does not put enough effort into stopping the spread of the diseases. It is advised to wear long-sleeved shirts in the evening and at night, which is the time mosquitoes are most active. Furthermore, individuals should spray themselves with an anti-insect solution. Moreover, as mosquitoes are located close to water sources (e.g. ponds and lakes), the removal of still water would aid in reducing the mosquito population. However, in the rainy seasons, this is nearly impossible. The bad water distribution system makes people store their water in boxes that are breeding places of the mosquitoes. Waste is also a problem, as every bottle cap can be a breeding place after the rain. We also learned that in Brazil, you can go to the doctor for free. However, most doctors do not have the equipment to perform diagnostic tests. Also the limited production capacity of tests is the main bottleneck. A diagnostic test for viral diseases that is cheap and can be used by these doctors would be beneficial, especially to test pregnant women or decide on further treatment options. Current serological diagnostic tests and other point-of-care tests are not reliable enough. More tests, like PCR and ELISA-based tests are needed for confirmation. Due to this Skype meeting and the information from the Brazilian Ministry of Health, we realized that many people are affected by these terrible diseases and everyone in Brazil knows someone who at least is, or has been, infected by viral diseases like dengue or Zika. These diseases have a great impact on the patient, the people close by and society in general. The project of USP-Brazil covers fighting mosquito-borne diseases from within the mosquito. They engineer symbiotic bacteria living in the guts of mosquitoes that can fight the viruses when the mosquito is infected, during the so-called paratransgenesis. One issue is, however, that this symbiotic bacteria should only start to produce the toxins in infected mosquitoes. Our project can be a nice addition by combining our engineered bacteria with their toxin system of the symbiotic bacteria. The resulting fusion is then able to detect the virus with the affinity body on the surface, after which our downstream signaling pathway results in the activation of the symbiotic bacteria to fight the virus or kill the mosquito. We learned that although it is more profitable to show your project in a one-sided positive way, it is more important to be honest about the goal and means of your project. In this way, the end-user can develop a fairer opinion on your product and their trust in the study increases. Through consultation with experts on the technical and human aspects of your project, you can find out what matters most about your project, and adapt your communication to the problems and needs of your target audience. This results in a more effective end product. The webinar can be watched on YouTube. We collaborated with iGEM Cologne-Duesseldorf in their postcard campaign. 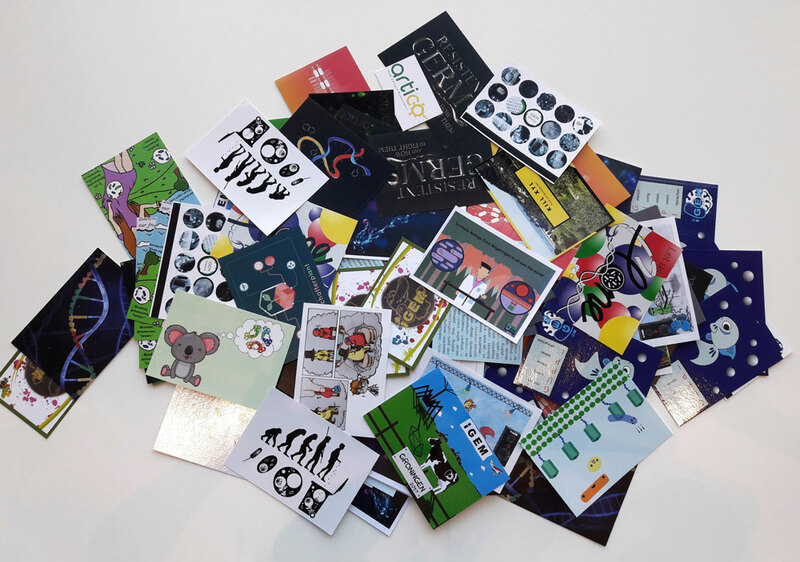 This is a worldwide campaign where iGEM teams designed their own postcards, which are then distributed by the organizing iGEM team all over the world. The ultimate goal was to promote synthetic biology to raise public awareness. We distributed the postcard both on Campus and at the Dutch National Institute for Public Health and the Environment (RIVM). This way, both students, scientists, as well as children and their parents, got to take these interesting cards home. We helped other iGEM teams in improving their project by filling in surveys, covering a wide variety of fields. We filled in surveys from iGEM BIT, Munich, Sydney_Australia, Vilnius-Lithuania, Washington and Waterloo. We hoped this helped their project a step further into the right direction. The RIVM, Rijksinstituut voor Volksgezondheid en Milieu, is the Dutch National Institute for Public Health and the Environment. They encourage discussions about synthetic biology and the latest developments in the field. This is related to the impact of synthetic biology on their fields of specialization. 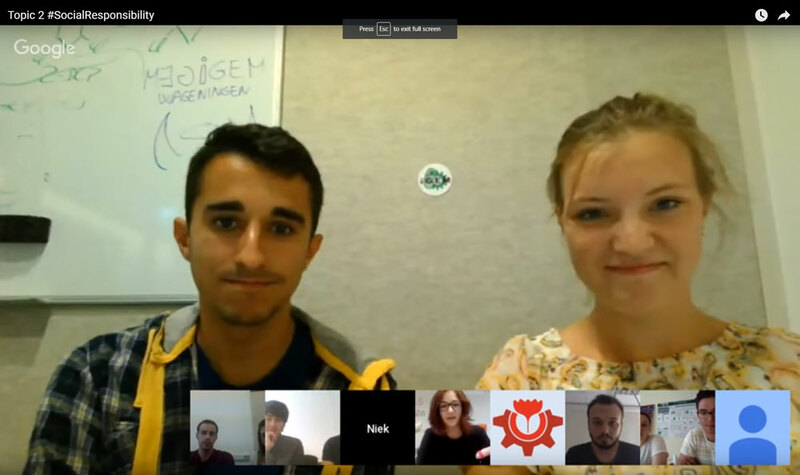 Part of this is a collaboration with Dutch iGEM teams with the potential to obtain funding. We wrote a proposal entitled “Think before doing” which describes our approach on biosafety and how we aim to reach and inform our target audiences. This includes both a technical infographic as well as a comic for children. The RIVM encouraged us to think about the safety aspects of both our project and the device and rewarded us with a grant of €3000. We put our proposal into practice during the “Kennisparade”. On this day, the RIVM opened their doors to the general public, in particular children, to teach them about science. We informed the public about safe genetic modification and “crafting with DNA”. Communication was maintained with RIVM to track the progress of our project. You can check the result of the biosafety project on our Safety & Ethics page. The Rathenau Institute is an organization aiming to pinpoint and solve today's questions on science, technology, and society. It also has an active role in informing politicians and society on these problems and possible solutions. An important part of their portfolio is synthetic biology. 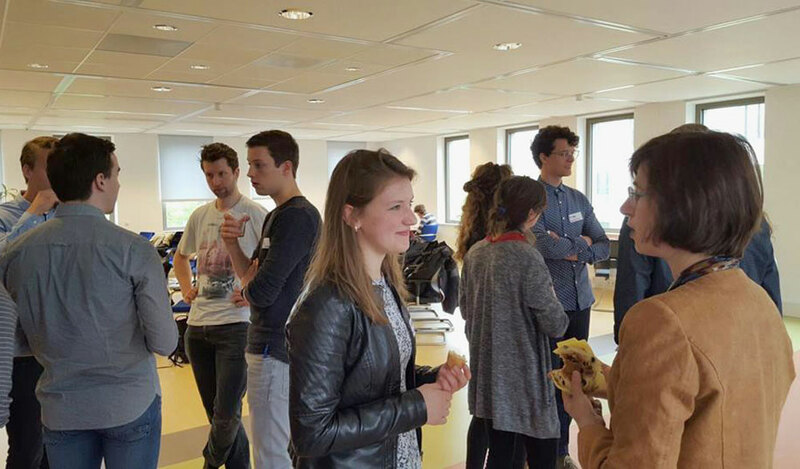 The Rathenau Institute collaborated with all Dutch iGEM teams for their “Guide to Integrated Human Practices” workshop in The Hague to share their expertise. The workshop consisted of several parts. First, the “speed dates” with experts on several human practices-related fields. 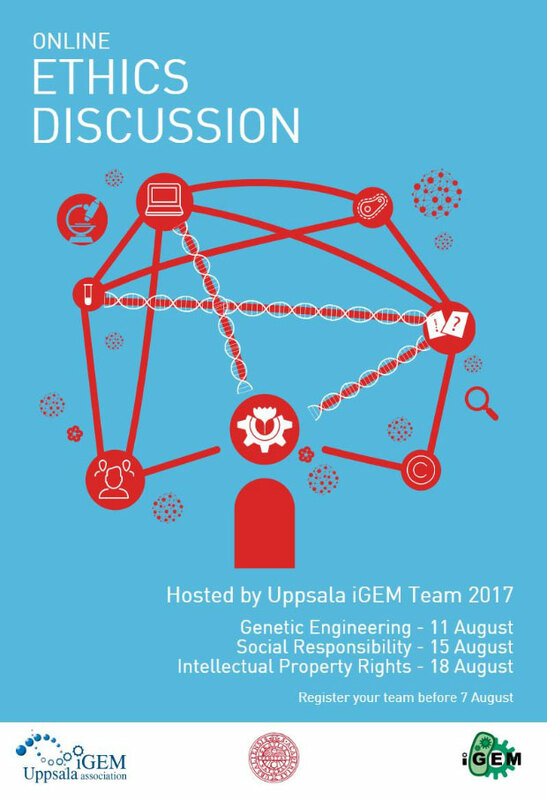 Each iGEM team got to practice presenting their case to these experts, followed by a short discussion and a round of questions. We got some very interesting feedback. 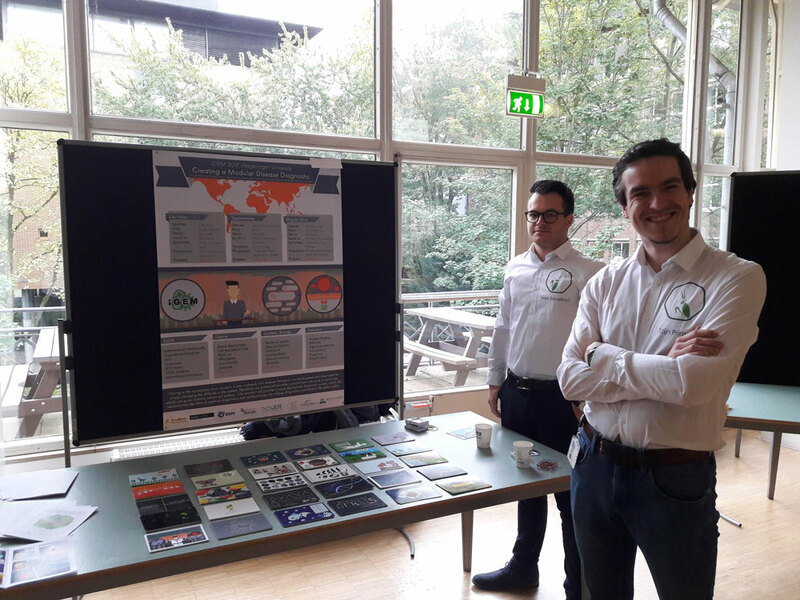 For example, experts advised us to get into contact with end-users, as well as NGOs, and to take advantage of the expertise present at the Wageningen University. They emphasized that, in order for a cheap and new diagnostic to be developed, it has to be both novel and successful. A good engagement will be the factor for success. Wieke Betten, from the Athena Institute (Vrije Universiteit Amsterdam), said it is important for us to specify the disease we are tackling, and which population is affected the most. Other experts agreed that a clear, coherent and closed idea is needed for people to understand the aim of the project. This way, we can combine both specificity and modularity of the device. After these speed dates we got an introduction to the iGEMmers Guide to The Future tool, developed by the Rathenau Institute. 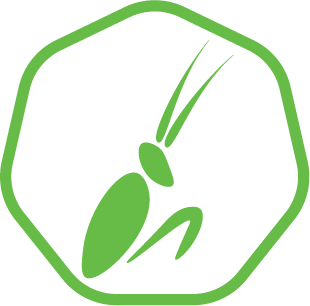 This very nice tool has exercises to facilitate human practices research for iGEM teams. For example, it contains guidelines for stakeholder brainstorming sessions, getting into contact with possible end-users and how to format techno-moral analysis of your SynBio project. We applied the principles of The Guide to e.g. our biosafety analysis and our future perspective analysis.